285 p., 15,3 x 21,0 cm. On the one hand, Thomas Hobbes (1588–1679) assumes that man is endowed with endless possibilites and constructs modern methodological science as well as the modern functional state for the purpose of effective self-preservation. On the other hand, Hobbes at the same time devises man and the state using the model of a machine, which can be reconstructed today as a cybernetic system. Based on both perspectives, the explanation given by Weiß incorporates the various methodological, anthropological, political and theological subjects, evidence of Hobbes’ continuing topicality, into his extensive interpretation. Das Buch von Ulrich Weiß verdient großes Lob: Seine Gesamtdarstellung des Hobbesschen Systems zeichnet sich nämlich aus durch eine klare unprätentiöse Sprache und durch eine dementsprechende Gegliedertheit und Transparenz des Gedankenganges, wobei doch nirgends die komplexe Problemlage unbillig verkürzt wird. 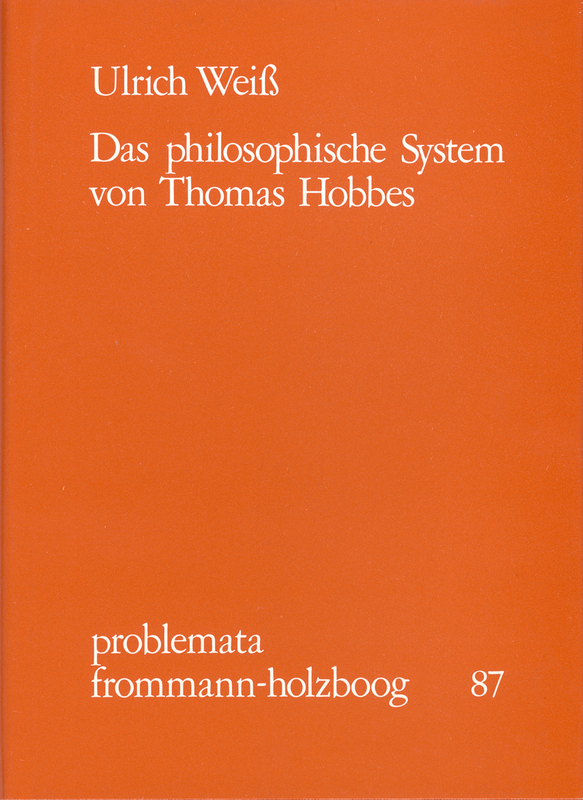 Ich wüßte kein Buch zu nennen, das ich lieber zur Einführung in das System des Hobbes empfehlen möchte.